One of the earliest treatments developed for skin care is called Intense Pulsed Light (IPL). Not a true laser, it uses pulses of high-intensity light to target melanin cells in the skin. Melanin cells are what color our skin and hair. IPL works well on rosacea, age spots, spider veins, and sun damage. Rosacea are enlarged blood vessels that appear red on the skin. They can result from sun damage, diet or injury. It often takes a series of treatment sessions to get decent results. Anyone with dark skin tones needs to use extreme caution with IPL treatments as they are known to cause burns on darker tones. It is highly advised to use a sunscreen of more than 50% for several months following treatments. Lasers use a specific wavelength of the light spectrum to target a specific type of skin cells. The light energy heats the cells in order to destroy them. Ablative lasers laser machines target the epidermis, vaporizing cells a single layer at a time to reach the intended effect. A common treatment using an ablative laser is skin resurfacing. It clears away dead skin cells so that the body can gradually make new skin. Since it causes intentional damage to the surface of the skin, it carries the risk of infection. Your doctor will advise about after-treatment care to avoid problem. Side effects include temporary redness, swelling, and rarely mild bleeding, though the clinics are careful to monitor this. Recovery can take a week or so, being careful to avoid sun exposure. Several spaced treatments are recommended, but one treatment series generally lasts about a year. It is most effective on mild to moderate wrinkles. Of course a wise diet and sunscreen use make a difference as well. Non-Ablative lasers function in the same way as ablative ones, except they target the dermis layer of skin below the surface. Heating the cells in the dermis results in the skin tightening or contracting. 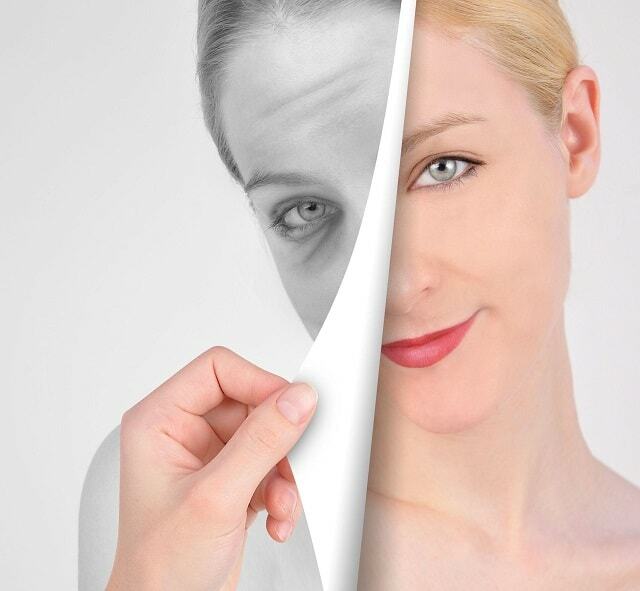 What’s more, collagen growth is stimulated to heal the cells and repair damage, thus rejuvenating the skin. This procedure leaves the surface layer intact and unharmed, so recovery is very quick with this method. There are minimal risks involved. It is most effective on mild to moderate wrinkles. Using ultrasound imaging technology, this treatment targets the deeper layer of skin called the dermis, heating the cells to encourage collagen production. It is noninvasive but does require a few days recovery time, during which the skin will be red, swollen, and irritated. It is most effective on fine lines and mild wrinkles. The results are often subtle. Radiofrequency treatments use sound waves to target the dermis layer of skin, creating heat to send the skin into repair mode by producing collagen. This procedure is similar to non-ablative laser treatments in many respects, but the treatment itself takes longer to perform. Certain Radiofrequency treatments may also be used to shrink belly fat and cellulite by medically destroying fat cells and harmful triglycerides. In that sense it is a health treatment as well as a beauty treatment. Avoid Radiofrequency treatments if you have a pacemaker, heart health issues or metal implants. Before seeking a treatment, make certain to discuss your medical history with your doctor and whether any of these treatments are right for you. Diabetes, pacemakers, metal implants and such may make some of the procedures dangerous to your health. People with underlying medical conditions should consult their doctor before treatments. Avoid using harsh products such as Retin-A for at least a month to six weeks prior to laser or IPL treatments. Remember too that you can seek a consultation with a beauty clinic prior to having the treatment to answer any questions you may have.